Medical transcription is primarily an online occupation, giving you a real opportunity to have a professional career from the comfort of your own home. A Medical Transcriptionist is responsible for the conversion of doctor-patient interactions into written documents that form part of the patient’s medical record. 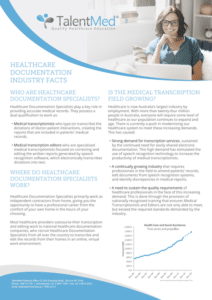 With most healthcare providers now outsourcing these services, there’s never been a higher demand for well-trained medical transcription professionals. Be your own boss, get rewarded for your efforts and be well positioned in the growing healthcare industry. The more you work, the more you’ll make. Begin your career as a qualified Medical Transcriptionist. This nationally accredited, industry endorsed course offers you the professional guidance, education and skills needed to succeed in Medical Transcription. Study at home, to work at home as an online medical transcriptionist with TalentMed. Job placement assistance included for graduates upon course completion. Personal support from qualified trainers with decades of experience in the Healthcare Documentation industry. Delivered entirely online through a fun and interactive learning portal. Industry approved, real world curriculum specifically created to prepare you for the workforce. Nationally Recognised Training designed to make you work ready. 12 months online access to expert-created curriculum (can be completed sooner). Access to hundreds of authentic transcription reports in 32+ medical specialities. Career Advisers who help discuss training packages, career outcomes and financial assistance. With decades of experience in the healthcare industry, making them uniquely qualified for your training. Simply enter your details below to receive a comprehensive course outline.